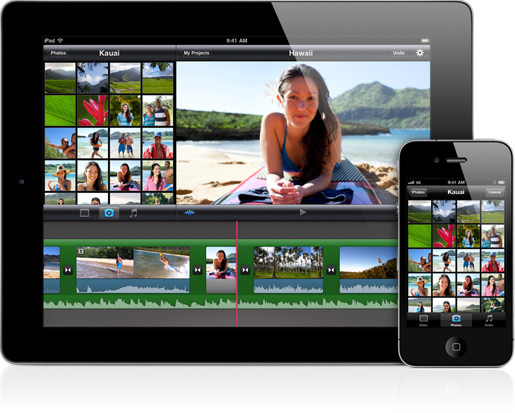 Apple (s aapl) released the updated version of its iMovie app for iOS devices Thursday. The new update makes the $4.99 app universal, so it can run on the iPad 2 in addition to the iPhone 4 and 4th generation iPod touch. Original iPad owners won’t be able to use the app, but it does introduce new features for existing iPhone and iPod touch users. If you’re lucky enough to get your hands on an iPad 2 tomorrow, the new iMovie features a reworked interface that much more closely resembles the OS X version of the program. You get a media viewer, timeline and preview screen all in the same landscape layout. iPad 2 users also get precision editing tools, which allow you to zoom in on your video timeline to fine-tune transitions, and get a better look at your video’s soundtrack. Users with Apple’s small-screened devices also get a few new tricks, including the ability to rotate your video in the editing preview screen, and other multi-touch gestures that expand your options for common editing tasks like zooming, splitting or trimming clips. There are also new themes, each of which contain new audio and video effects. Apple also included better handling of photos in iMovie. You get automatic face detection for photo slideshow transition effects, and you can create text overlays for images, too. Soundtrack options are also better, letting you use three separate audio tracks which can use songs from your on-device iTunes library, or recorded directly from your device’s microphone. There are also a bunch of new sound effects and songs included in iMovie itself in the update. New sharing options should please social movie makers. You can now publish to Facebook, Vimeo, or CNN iReport (s twx) right from within the app, and use AirPlay to push your video out to an Apple TV-connected display. It’d be nice if Apple made this available for the original iPad, too, since I don’t see why you have to be able to shoot video on a device in order to be able to edit with it, but Apple clearly has its reasons (including providing a small upgrade incentive, possibly). Still, this is one of the apps I’m most looking forward to trying out on the iPad 2 when I eventually get one, though I’ll probably depend more on video shot on my iPhone 4 than on that filmed using the iPad’s rear camera. How about you? I am a big apple fan, and I do own an ipad, it is a shame they did not release iMovie for the ipad1 I have photos and movies on there so it would be fantasic to use the ipad to edit etc I am not sure people will use the ipad 2 to film apart from Facebook due to the size however for editing it would be great. Apart from that well done Applewith updates, all works a treat with the apple tv. I am a big apple fan, and I do own an ipad, it is a shame they did not release iMovie for the ipad1 I have photos and movies on there so it would be fantasic to use the ipad to edit etc I am not sure people with use the ipad 2 to film apart from Facebook due to the size however for editing it would be great. Apart from that well done Apple all works a treat with the apple tv. Hey guys I have a problem, when i press the “Check for updates” on itunes it doesn’t see the new version of iMovie !! !… I have it on my iPhone 4. I actually had the same issue. If you search for iMovie in the App Store and just click the buy button as if to reinstall, it updates your app.